Ask around for how to grow or invest your money and you will get different answers. However, in my experience, most Indians are still afraid of putting in their hard earned money into equity or stock markets. Till some decades back, the problem might have been a lack of information while today information overload can sometimes lead to decision paralysis. Women, specifically, are often more risk-averse even though they make for better investors as claimed by Warren Buffet. We, women, do not want to be playing around with our money too much or putting in too much time or effort to put our money in and out of assets. Instead of being a weakness that is actually what gives our portfolios more stability. When you decide you want to use equities as a vehicle to make your money grow, there can be two means – direct company stocks or mutual funds. Direct stocks can be far more rewarding but come with their share of risk and volatility. The time, effort and attention required to consistently manage your own portfolio on the basis of proper research into individual stocks can be mind-numbing. Day trading in stocks is a zero-sum game which, in the long run, will only end up with the investor losing money. Mutual Funds, on the other hand, involve a big team of specialized professionals managing a large portfolio. When you invest through mutual funds, you choose to make big companies work for you by buying a slice of the pie of the portfolio being managed by them in lieu of a negligible management fee built into the mutual fund price or the Net Asset Value, recorded at the end of every market day. With India being a growth story, most mutual funds end up delivering much higher returns to easily beat inflation and help you grow your money. There are various mutual fund houses in India – global, domestic or joint ventures. What type of mutual funds should I invest in? Equity mutual funds are the type of funds which invest between 30 and 70% of their funds in equity markets. Within equity too, on the basis of the company’s market capitalization (share price multiplied by total shares outstanding), the type of stocks are categorized as small cap, mid cap, and large cap. As a rule of thumb, large-cap stocks are more stable and less risky. Considering the reduced risk, potential returns are also lesser than the other two categories as it has reached a scale where growth potential begins to get limited. Currently, SEBI has defined large-cap companies as the 100 biggest traded companies on the basis of market capitalization. You might have often heard the term blue chip stocks or blue-chip fund. 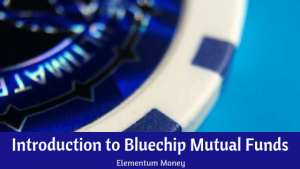 I just came across an interesting fact that blue chip is a terminology picked up from poker, where the blue colored poker chips are of the highest value. Likewise, in the stock market today, blue chip is a term used to refer to high-quality stocks, generally large cap. There are many mutual fund companies that offer a bluechip fund. ICICI Prudential Bluechip Fund is one such fund which has a stellar track record to its name. Completing ten years last May, the fund is an open-ended mutual fund which means that you can choose to invest in it at any point in time. As per Value Research, ICICI Prudential Bluechip fund has returned 16.34% as compared to the category index return of 11.44% in the same period, making it the top fund in its category in the last decade. While past returns are not the best indicator for future prospects, to me it does suggest solid management combined with good stock picks and backed by institutional research. Bluechip funds are generally meant for long-term stable wealth creation. If you are convinced you can be invested for the long term with no need for withdrawal, invest in the growth version of the scheme. However, if you feel the need for regular income coming in from your investment, then the dividend scheme works better for you. Whatever your risk profile, ICICI Bluechip Fund can provide an element of stable long-term returns to your portfolio. Note: This post is in collaboration with Blogchatter.